Background: Erythema multiforme is an immune mediated cutaneous eruption. It is most frequently associated with infectious disease and drug intake. However, it can be associated with malignant disease such as leukemia. Aim: Report new case of erythema multiforme associated to an acute monoytic leukemia. Materials and methods: We report the case of a women presenting with erythema multiforme leading to the diagnosis of acute monocytic leukemia. Results: A 54-year old woman was admitted in our internal medicine department for an extensive skin rash on the face and the limbs which had been evolving for 15 days prior to admission associated with asthenia and important weight loss. Clinical examination showed an erythematous; purpurish infiltrated non purpuric nodules and papules having symmetrical distribution on the face, neck and the four limbs. Blood cell count revealed non regenerative macrocytic anemia (hemoglobin: 8.9 g/dl with mean corpuscular volume at 102 fl), thrombocytopenia (platelet: 44000/mm3) and leukocytosis at 13200/mm3 with monocyte count at 7190/mm3. A biopsy of nodular cutaneous lesions showed lesions evoking erythema multiforme. A bone marrow biopsy was performed revealing a monoblast infiltration of the marrow estimated at 20%. The diagnosis of monocytic leukemia, M5 in the French-American- British classification (FAB) was retained. 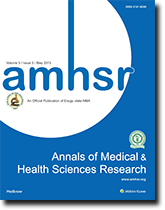 Conclusion: Although erythema multiforme can be attributed to various conditions such as drug intake and environmental xenobiotic which became a cause of concern in developing countries, it still warrants a thorough investigation that can lead to a severe disease diagnosis such as monocytic leukemia. Erythema multiforme is an immune mediated cutaneous eruption; it’s characterized by target or iris lesions distributed symmetrically on the trunk and extremities. It is most frequently associated with infectious disease and drug intake. However, it can be associated with malignant disease such as leukemia. Blood steam and bone marrow involvement are the most common in leukemia but not exclusive. Skin manifestations in patient with malignant hematology disease are very diverse. It can lead to diagnosis of unknown disease. It also can manifest in patients already diagnosed with hematologic malignant disease and can alter the prognosis and therapeutic approach of such disease. Acute monocytic leukemia is frequently associated with cutaneous lesions. We report the case of a women presenting with erythema multiforme leading to the diagnosis of acute monocytic leukemia. 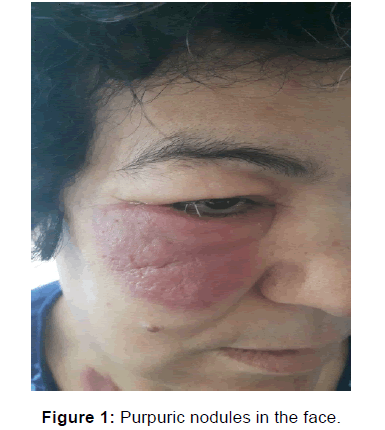 A 54-year old woman was admitted in our internal medicine department for an extensive skin rash on the face and the limbs which had been evolving for 15 days prior to admission associated with asthenia and important weight loss. She had a medical history of invasive ductal carcinoma of the right breast at the age of 52 treated by total mastectomy with chemotherapy and hormonal therapy (letrozole). Clinical examination showed an erythematous; purpurish infiltrated non purpuric nodules and papules having symmetrical distribution on the face, neck and the four limbs consistent with the diagnosis of erythema multiforme. There were no lesions on the trunk and scalp. Otherwise, patient had no fever; cardio-pulmonary examination was without abnormalities and there was no hepatomegaly, splenomegaly or palpable lymphadenopathy. Left breast examination was also normal (Figures 1 and 2). Figure 1: Purpuric nodules in the face. Figure 2: Purpuric nodules in the hand. Blood cell count revealed non regenerative macrocytic anemia (hemoglobin: 8.9 g/dl with mean corpuscular volume at 102 fl), thrombocytopenia (platelet: 44000/mm3) and leukocytosis at 13200/mm3 with monocyte count at 7190/mm3. C-reactive protein was 103 mg/l with no other laboratory evidence of inflammation. Erythrocyte sedimentation rate and fibrinogen level were normal. Hepatic and renal function tests were within normal range. Vitamin B12 and folate level were respectively at 524 pg/ml and 7.75 ng/ml (vitamin B12 range value: 193-982 pg/ml, folate range value: 3-15 ng/ml). Lactate dehydrogenase was within normal range. Direct Coombs test was negative. Medication was suspected as the patient was on hormonal therapy but no improvement was noted in skin lesions or biologic anomalies after discontinuation of Letrozole®. Patient denied other medications or illicit drug intake. A biopsy of nodular cutaneous lesions revealed the presence of keratinocyte necrosis associated with edema of the dermis, which is the site of a predominantly mononuclear inflammatory infiltrate evoking erythema multiforme. Given the bicytopenia, a bone marrow biopsy was performed revealing a monoblast infiltration of the marrow estimated at 20%. The diagnosis of monocytic leukemia, M5 in the French- American-British classification (FAB) was retained. Thoracic and abdominal computed tomography was performed. No lymphadenopathy, hepatomegaly or splenomegaly was detected. The patient was transferred in hematology department. Acute myeloid leukemia is classified in eight subtypes in the FAB classification with acute monocytic leukemia being classified as M5. Although a rare type of acute myeloid leukemia, cutaneous manifestations are more likely to be encountered in M5 than any other type. It is characterized by the presence of monoblasts or a mixture of monoblasts and promonocytes invading the blood steam and bone marrow. Skin manifestations observed in patients with leukemia can be divided into four groups: specific lesions, paraneoplastic lesions, infectious skin lesions and chemotherapy related skin lesions. Nonspecific leukemic lesions or leukemid can be observed in 30% of patient with myeloid leukemia. No leukemic cells are found within these lesions. A variety of skin disorder cans be observed such as pyoderma gangrenosum, vasculitis, acute febrile neutrophilic dermatosis and erythema nodosum. [6-8] Although, mostly related to infection and toxic such as drug intake and xenobiotic, erythema multiforme can also be observed in myeloid leukemia. This immune mediated skin disorder has been rarely reported as the presenting sign in acute monocytic leukemia as it was the case in our patient. [9,10] Specific cutaneous manifestations, also known as leukemia cutis are less common, observed in 2 to 12% of patient with acute myeloid leukemia. It represents an authentic leukemic cells infiltration of the skin. Although rare, it can appear before the presence of leukemic cell can be detected in peripheral blood or bone marrow. Such condition being referred to as aleukemic leukemia cutis or monocytic sarcoma proposed by Soria et al. Mechanisms for these skin lesions are yet to be well characterized. Whether the leukemic clone origin is extra medullary with hematogenous spread to bone marrow and other anatomical sites or whether it originates from the bone marrow and then disseminate in cutaneous tissues is still not clear. Leukemia cutis can also be observed concomitantly with systemic leukemia or even after complete remission and is commonly a sign of relapse. Specific cutaneous lesions with involvement of leukemic cells are indicative of poor prognosis with failure to obtain remission after chemotherapy. This stress the importance of a quick diagnosis based on clinical and histological finding of skin lesions allowing for an early start of treatment with aggressive chemotherapy. 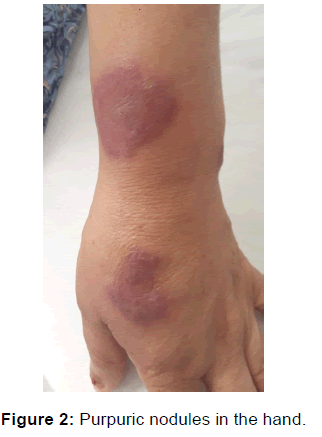 Although erythema multiforme can be attributed to various conditions such as drug intake and environmental xenobiotic which became a cause of concern in developing countries, it still warrants a thorough investigation that can lead to a severe disease diagnosis. Extra medullary deposit of leukemic cells has been identified in virtually all organs. A benign looking skin rash may lead the diagnosis astray, especially in case of absence of peripheral blood and bone marrow anomalies. Diagnosis can be easily suspected in patient with history of leukemia. It’s far more challenging to retain the diagnosis of leukemia cutis in the absence of sign of systemic involvement in patient with no leukemia history. Skin biopsy and immunohistochimical examination are required for an early diagnosis. Walter RB, Othus M, Burnett AK, Lawenberg B, Kantarjian HM, Ossenkoppele GJ, et al. Significance of FAB subclassification of âÂÂacute myeloid leukemia, NOSâÂÂ in the 2008 WHO classification: Analysis of 5848 newly diagnosed patients. Blood. 2013 Mar 28; 121(13): 2424âÂÂ31. Braverman M. Skin signs of systemic disease. 2nd ed. Philadelphia: Saunders, USA. 1981: 179-196. Hattori T, Amano H, Nagai Y, Ishikawa O. Leukemia cutis in a patient with acute monocytic leukemia presenting as unique facial erythema. Journal of Dermatology 2008; 35: 671-674. Stawiski MA. Skin manifestations of leukemias and lymphomas. Cutis 1978; 21: 814-818. Yonal I, Hindilerden F, Coskun R, Dogan OI, Nalcaci M. Aleukemic leukemia cutis manifesting with disseminated nodular eruptions and a plaque preceding acute monocytic leukemia: A case report. Case Rep Oncol. 2011; 4: 547-554. Desch JK, Smoller BR. The spectrum of cutaneous disease in leukemias. J Cutan Pathol. 1993; 20: 407-410. Gru AA, Coughlin CC, Schapiro ML, Lombardi M, Martin A, Bayliss SJ, et al. Pediatric Aleukemic Leukemia Cutis: Report of 3 Cases and Review of the Literature. Am J Dermatopathol 2015; 37: 477-484. Isik SR, Karakaya G, Erkin G, Kalyoncu AF. Multidrug-induced erythema multiforme. J Investig Allergol Clin Immunol. 2007; 17: 196-198. Forman l. Erythema multiforme and nodosum-like eruption as the presenting sign of monoblastic leukaemia. Proc r soc med. 1964; 57: 1097-1098. Aboutalebi A, Korman JB, Sohani AR, Hasserjian RP, Louissaint A, Le L, et al. Aleukemic cutaneous myeloid sarcoma. J Cutan Pathol. 2013; 40: 996-1005. Soria C, Orradre JL, GarcÃ­a-Almagro D, MartÃ­nes B, Algara P, Piris MA. True histiocytic lymphoma (monocytic sarcoma). Am J Dermatopathol 1992; 14: 511-517. Hejmadi RK, Thompson D, Shah F, Naresh KN. Cutaneous presentation of aleukemic monoblastic leukemia cutis - a case report and review of literature with focus on immunohistochemistry. J Cutan Pathol. 2008; 35: 46-49. Khoshnaw N, Muhammad BA. Leukemia cutis preceding bone marrow relapse in acute monocytic leukemia. Indian J Dermatol Venereol Leprol. 2016; 82: 713-716.